What a kind and lovely book this is! Barry and Dorothy Hawkins decide to rescue, foster, and find homes for German shepherds, and this book is an account of their first year doing just that.The venture begins while Dorothy is in hospital—Barrie receives calls about a couple of different dogs who need homes and Dorothy comes home to them, bless her—and continues with so many wonderful dogs who have been abandoned or given up by people who, for the most part, should never have had a dog to begin with. (One exception is the woman who is dying and wants her dog to have a good home; she comes to the Hawkinses for help. But this is one incredible exception. )There are many stories contained in this slim volume, many of which will make animal lovers smile with tears in their eyes. My own favorite is that of a woman who wants to adopt a puppy that the Hawkinses have for adoption; she has lost her dog and misses the companionship. It's nearly Christmas, and she spends a great deal of time getting to know the puppy...before deciding that a puppy just isn't for her. She apologizes profusely for having taken up Barrie's and Dorothy's time, and leaves.On the same day, the Hawkinses get a call about a dog who's been found tied to the bannister of a house after his people have moved away; he's emaciated, ill, old. Barrie and Dorothy take him to their vet—a minor but important character in this book—who simply shakes her head and says that there's not much to be done; keep him comfortable...he has only weeks. (Yes, I was weeping at this point. )So, they take him home. Minutes later, the woman who had come to see the puppy bustles to their door with a Christmas tree that she's gotten from her uncle who has a tree farm—to make up for taking up so much of their time, she explains. She sees the poor old dog that the Hawkinses have just brought home with them and as she and the dog look at one another, his tail wags feebly; as Barrie writes, “It was love at first sight for them both.” Not only does he survive for the next few weeks, he lives happily until the following autumn; when he dies, his friend buries him under a tree where he has spent hours just enjoying his new-found life.If you're crazy about animals, you will tear up while you read this book. But because Barrie and Dorothy Hawkins are so committed to giving their rescued dogs a good life, you will feel better from having known them through this book...from knowing that there are some really good people out there. I'm a sucker for a good animal story, and this is a pretty good one. Extra points go to it because most of the dogs the couple rescued through the book are German Shepherds (A.K.A. Alsatians) which are one of my favourite breeds! <3Barrie and Dorothy Hawkins live in England, and the two of them make the decision after their dog passes away that they will take in foster & rescue dogs to take care of and find homes for. The book follows their adventures during the first 18 months of their journey, and the 18 dogs they take into their home over that period. From 'Jess', the dog some... well, scumbag is probably putting it too nicely - brought into a vet to be put down not because of health problems or necessity but to get revenge on his girlfriend, to 'Friend' who was found by a young man in London, who required months of nursing to regain his health after being starved and mistreated. There are a lot of sad parts in the book but many funny and uplifting moments as well. Definitely another one I'd recommend for animal lovers. Such a sweet book- in honor of a former pet, and in thanksgiving for medical care that saved the life of his wife, a man decided to turn his home and his life over to fostering abandoned German Shepherds. everyone who has ever had the privilege of loving and being loved by a dog will appreciate this gentle British couple and their extraordinary compassion and decency. I found this book while organizing the pet and animals section and the title was cute so I thought it would be a nice, light read. This book is a true story about a German Shepard rescue run by a husband and wife in the UK. Although it was slow at parts overall it was a very thoughtful and heartwarming account of their journey. I truly appreciate how much of their time and resources they put in to save so many dogs and give them a new and better life. Every dog deserves to be happy and every dog has the potential to make an owner even happier. It takes a special kind of person to be so devoted to this type of work and I am sure that Mr. and Mrs. Hawkins are very special people. I was taken by this book. It is sweet, well-written, and self-effacing. Without really knowing what they are doing or what they are in for, Barrie and his wife Dorothy plunge into rescuing, first, German Shepherds, and then, any dog that might be related to or has perhaps met a German Shepherd. Their generosity, humor, and decency carry them through. Very entertaining.Many dog stories in one.Opening a rescue for German Shepherds is more work than was thought at first. Plus it turned out to be more expensive. They had a beloved dog. And, after she was gone, they wanted to do something for other dogs. This is a really sweet story of a British couple who gets into the service of rescuing German Shepherds. A series of chapters about different dogs and their successes! Really enjoyed. Uplifting and upbeat. For all dog lovers! Oh what kind, brave people! Hawkins writes of he and his wife's adventures in dog rescue and is honest and entertaining in describing their mistakes and successes. And because it involves dogs--there will be some tears but mostly the happy kind. Delightful true story of a lovely couple who started foster mainly German Shepherds. Quick, uplifting read. Reminiscent of James Herriot's books. Written in an easy going conversational style, this book is uplifting, heart-warming & fun! This is an incredibly sweet book! Highly recommended to dog lovers everywhere! Chock full of German Shepherds and a wonderful couple doing rescue work. What else is there to say? I loved it. Jami and I read this together. It makes you laugh, cry, and want to bring home all the needy dogs out there. 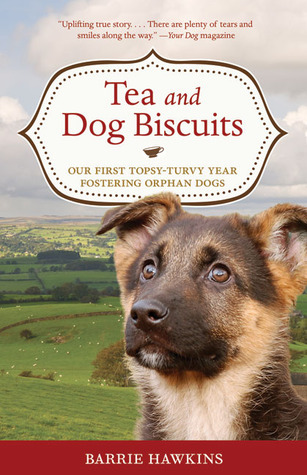 It's a great read for anyone who is interested in fostering dogs or adopting dogs. A relaxing, fun read about a couple that becomes a foster home for dogs. How could a story about a couple rescuing dogs be anything but heart warming? The German Shepherds in this book are all deserving of love and 2nd chances and I wish I could hug them all. If you have dogs, especially GSDs, or are involved in dog rescue, I think you would enjoy this book immensely. Enjoyable read. Loved the couple who made this commitment to dogs. Currently reading and enjoying very much!